I’ve just returned from an amazing summer break in London and Lebanon, where I discovered new places, foods, and cultures. To make matters even better, the entire trip culminated with the beautiful wedding of two close friends–simply awesome! Before I left on the trip, I scheduled this blog post with tips on how to keep writing during vacation, and I’m pleased to say that I implemented each and every one of them! However, I concentrated on blogging and working on a new Business, Publishing, and Life episode. I put my latest book of the Amish in College series, Amish Baker: Mercy’s Book, on hold to focus on enjoying the vacay and keeping up my online presence. I figured I could move this project to the back burner since I’d had a ton of momentum before I’d left on vacation, I had a clear vision of the plot line, and I was ahead in my writing quota; I’d actually done this on purpose so I could take more time off without feeling pressure. But when I returned, I was dismayed to realize that I’d been gone from the project for so long that I almost didn’t remember where I’d left off. I felt out of sync with the story, almost as though my writing itself was as jet-lagged as my body felt. Luckily, I have recovered from enough writing vacays to realize that it’s totally possible to regain your writing mojo after vacation–and fast. Here are 5 foolproof tips that I’ve implemented over the last few days. Hopefully, they’ll help you next time you return from a writing vacay! The stunning views and fun activities on vacation may be inspirational, but how to focus all that stimulation into your writing? Read on! 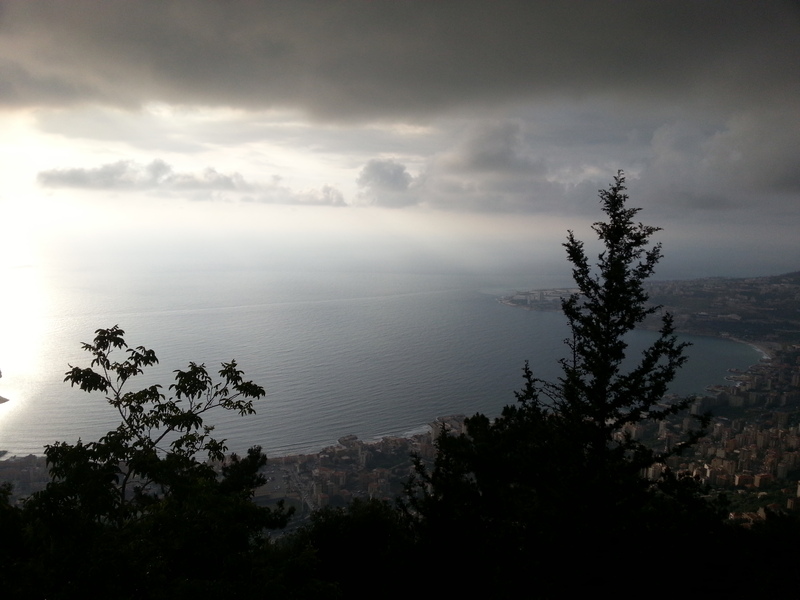 This photo was taken in Harissa, at the top of a mountain in Lebanon. Be realistic – Allow time for a good night’s sleep, unpacking, organizing your house, and recovering from that dreaded jet-lag. (I am very experienced with this, since I was 10 time zones outside my norm.) If you try to delve directly into writing, it may feel forced, and you’ll be distracted by all the other things you have to do. Plus, it’s a known fact that clutter–whether it’s physical or emotional–contributes to stress and actually saps creativity and productivity. So organize first, and write later. You’ll be glad you did. Write a mantra – Before you begin your writing session, compose a mantra for that day and/or week. It can be one word, one sentence, or an entire paragraph. Thinking of a mantra before yoga practice keeps you focused and goal-oriented the entire time, and devising a mantra before you begin writing does exactly the same thing. Write a checklist – After you’ve come up with a mantra, it’s time to get specific–with checklists packed with goals for the coming week. I wrote my mantra and checklist in the car on the way to the airport, since that was when I felt most inspired. Many times, when you’re traveling home, you’re actually looking forward to getting back to work, and this was the case for me–my brain was literally swimming with things I wanted to accomplish. Once I was settled in at home, I revisited the checklist, and began accomplishing goals from it one by one–woohoo! I’ve read over the checklist, monitoring my progress every day, and I’ve found that I’m right on track with what I’d visualized during that faraway car ride. Discipline is key, but the most important component is visualizing the checklist in the first place–and writing it down so you can use it to track your progress. Find inspiration from your experiences – Remember that inspiration notebook and journal I was talking about? Now, it comes in handy. If you’re not entirely ready to immerse yourself in your story yet, get the creative juices flowing by writing a blog post about things that inspired you during vacation, or write another journal entry, or perhaps a short story or poem. Writing begets more writing, after all! Writers out there, have you faced a similar dilemma after vacation? If so, how did you deal with it? I’d love to hear your tips and reflections! I like these. Rereading the chapters where you left off to get back in the mindset where you were is so much smarter than starting over at the beginning. Good morning and happy Friday the 13th! I know that I am once again posting a bit early today, but I found this and wanted to share it with you all. FWA is gearing up for a the remaining mini-conferences this year while also preparing for the annual conference later this year, which means some of you out there will be doing a little traveling soon. It’s also summer, so there’s a good chance that you’ll be heading somewhere. If that’s the case, this blog post might just be of help. When I went to the conference last year, it was one of the few times I have traveled and certainly one of the longer trips I have taken. After participating in all the awesome events and volunteering at some interesting workshops, I admit to having lost my writing mojo for a while. It happens. You have a lot of fun, connect with so many people, and learn lots of information so there is bound to be a little overload which can leave you feeling drained. That’s why I thought this would be helpful. The tips are great ways to get yourself out of “vacation mode” and back into the groove at home. I particularly like #1 and #5, partly because they were so relevant to me and my experience. I think I tried to push myself a bit too much at first and just ended up making the situation even worse. I also was able to help with a great workshop that dealt with dreams which led to an idea. You never know where those will come from! I also recommend the post she linked to about getting that writing time in while on vacation. Did you find any of these tips helpful? Do you have any of your own methods for getting back the writing mojo? I’d love to hear about them, and I’m sure others would to.